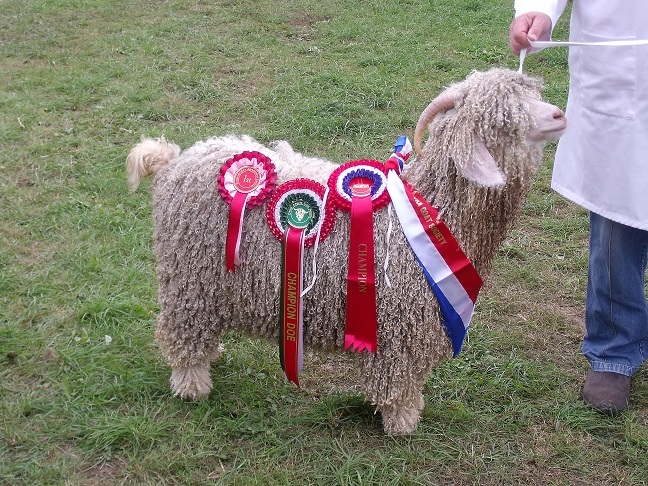 We first started keeping goats nearly forty five years ago when angora goats became available in the UK we bought three embryos. Four doe kids were born and came to us when we moved to Wales in 1987. We had also purchased an imported buck kid before we moved which was quarantined. From these animals and the occasional purchase we now run between seventy and a hundred goats. We decided to do a small diversification and to process our own mohair. They are shorn twice a year and the first time three of us together with our scissors carefully removed the fleeces of five goats! However, since that occasion they have been shorn the same way as the sheep. We select the best which we have spun and we sell the yarn both dyed and undyed in our small showroom together with garments and luxurious skins and cushions. The rest of our clip is sold through the small co-operative Mohair Marketing Board. We usually have goats for sale and are pleased to discuss your requirements with you. ACCESS: Our farm is approached by a gravel drive which is a short distance from the road. There is a short walk across the front of the house, down one step and up another into the showroom. Please ask for any further information.